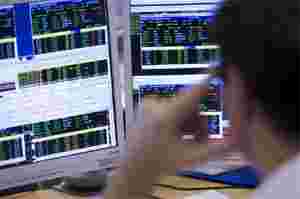 London: European equities finished weaker in a choppy, thinly-traded session on Tuesday, led lower by retail shares after the world’s No.4 retailer Metro issued a profit warning saying the euro zone debt crisis was undermining consumer confidence. The FTSEurofirst 300 index of top European shares closed 0.4% lower at 989.67 points after falling as low as 985.67. It has gained about 11% since hitting a three-week low in late November, but is down 11.5% so far in 2011. Volume was 77.5% of its 90-day average. German retailer Metro was the biggest faller, down 13.9% in volume nearly six times its 90-day daily average, while the STOXX Europe 600 Retail Index fell 2.1% to top the sector decliners’ list. “It is unnerving, but not unexpected, to see a major retailer waiver so early into the Christmas season," Will Hedden, sales trader at IG Markets, said. “Blame for the wobble is being attributed to weakness in European trading outside of its backbone German business, and it is hard to see this changing as the effects of the debt crisis and austerity in Europe filter down to the man on the street." Investors trained their sight on the 8-9 December summit, with French President Nicolas Sarkozy and German Chancellor Angela Merkel determined to change rules to impose mandatory penalties on countries that exceed deficit targets. European Council President Herman Van Rompuy told EU leaders in an interim report to be discussed at the summit that tighter oversight of euro zone fiscal policy can be achieved through minor, rapid adjustments to the EU treaty. “If the European leaders come up with something concrete, we could expect a bit of euphoria, but that would be sustainable only if it could be implemented," said Felicity Smith, fund manager at Bedlam Asset Management, which manages $700 million. “However, the risk of a messy unwind in share prices remains if they don’t agree. Investors should focus on companies that can generate earnings growth, (can) finance themselves and are not dependent on cycles." Smith said she could identify several interesting companies in sectors such as healthcare and consumer staples, adding investors should avoid stocks that were dependent on discretionary spending, especially those which relied on easy credit. The euro zone’s blue-chip Euro STOXX 50 index fell 0.5% to 2,356.71 points. Charts showed the index faced its first support at around 2,345 -- the 123.6% retracement from the 23-29 September impulse wave, and further at around 2,232 -- the 20-day moving average. “A softer opening today, combined with a bearish divergence of the MACD oscillator using standard parameters with the price action, suggests increased risks of a sell-off, should the five-day moving average providing a trailing support be broken on a sustained basis," said Dmytro Bondar, technical analyst at RBS. Banks lost ground, with the sector index falling 0.7%. The index, down 30% this year, is the worst performer so far due to massive exposure to peripheral euro zone sovereign debt, fear of default or bankruptcy and on concerns the euro zone treaty could collapse. “The coming months may play out in a number of different ways, but the risk of a full euro break-up or at least a number of countries leaving the single currency will continue to hang over the markets. Specifically, the focus will continue to be on the European banking sector," Jefferies said in a note. Nomura said in its 2012 Global Strategy Outlook report that its sector weightings reflected its expectation that risk appetite will improve over the course of the year and it held some “overweight" positions in higher-risk areas. “We overweight cyclicals, in those areas which appear to be fully factoring in a poor economic outlook. Both oil producers and mining companies appear to us to be underpriced relative to their respective levels of profitability and the current levels of commodity prices," Ian Scott, global head of equity strategy and quantitative research at Nomura, said.